In your career life, you have to distinguish the difference between working hard and working smart. There is a common misconception among people that an individual’s productivity solely reflects on how busy they are when they’re in their office space in the Philippines. Although it’s true that you have to take action in order for you to accomplish your goals, you still have to ponder upon a certain thought – is what you’re doing necessary? Oftentimes, businessmen make their career lives complicated. They’re working harder than they should and it often leads them to feeling burned out. Being too stressed at work doesn’t just take away your joy, but it also makes you counterproductive. When you’re working smart, you could do less, but twice as productive as when you’re working hard. When people start to feel too busy, they have the tendency to feel overwhelmed. When this happens, there are instances that your mind will refuse to cooperate even when you need to get to work. If you feel like you have too much on your plate, take the time to screen them and pick out which are your key tasks. If important tasks are left undone, you could still be barely making progress even when you’ve worked hard all day. Never associate productivity with being too busy. Learn to prioritize and take care of your well-being. It is common for people to believe that the more choices available, the better. Often times, they disregard the fact that having too many options could cause you the headache of choosing. To save you from that stress, you should narrow down your options and keep your priorities straight. Through that, you could also evade the frustration that regret and indecisiveness bring. When you have to make a decision, take the time to examine your options and see if they’re aligned to your goals and values. Keep your eyes on what you want to achieve. New technology has undoubtedly made our lives easier. When you browse through the Internet, you will find applications for almost everything that you need. But, even if you’ve acquired all the productivity apps available, when you’re not getting things done, they’re still useless. Technology could help you work more efficiently – but you don’t necessarily need them to achieve your goals. Sometimes the traditional pen and paper could make you more productive than when you’re using an app. You don’t need to be on trend, you have to get to work. Even in the workplace, the concept of minimalism could come in handy. It is the act of intentionally freeing yourself from the things that distract you from the things that matter. People have the tendency to hoard things, choices, and past experiences. Sometimes individuals hold on to useless things because of their sentimental value. But when you declutter, you focus more on the things that are essential. Take the time to let go of the unnecessary things on your desk and even on your personal computer. This may become tedious work at first, but it creates a workspace that’s conducive for work. 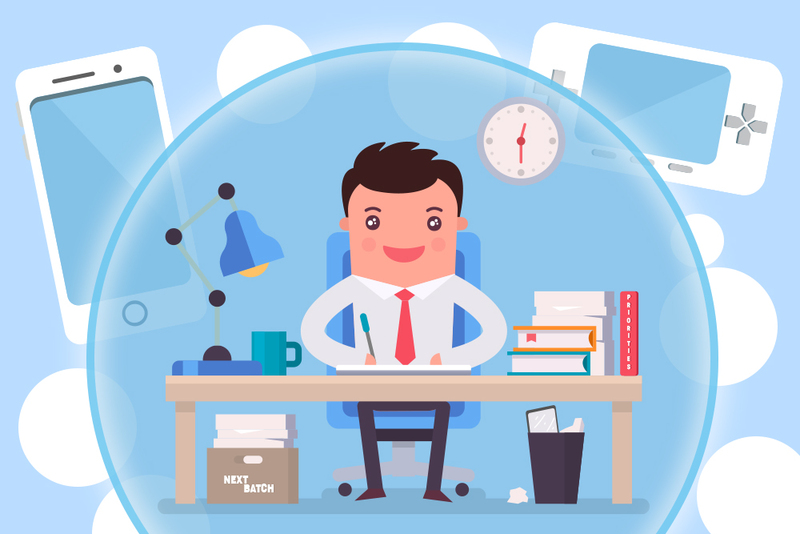 You could improve your productivity through removing physical and virtual distractions. When your work performance is dependent on how you’re feeling, there will be days that you’ll become unproductive. When you walk your life with this attitude, you could turn down a golden opportunity just because your temporary feelings deceived your long-term goals. Fueling your performance with commitment instead of feelings will definitely enable you to advance in your career life. When you start to feel emotionally or mentally unstable, appeal to your logical mind and hold on to your commitment to get things done.